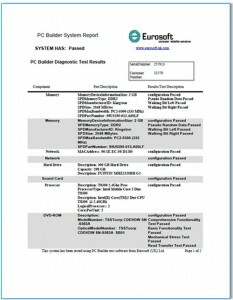 PC Builder™ – the ultimate test management software suite providing you with reliable computer diagnostics, imaging needs – Microsoft DPK and COAs, BIOS flashing – and data erasure in a powerful framework for your automated PC manufacturing and refurbishment operations. Whether you’re shipping 1,000 units a month or more, PC Builder provides the test tools and features you need for trade and retail PCs alike. Everyone needs a partner they can count on …. Eurosoft, is your “go-to-guy” partner with over 35 years in the industry. We focus on tools to get your testing job done correctly, the first time. Providing proprietary testing solutions for Intel-compatible or PC hardware platforms – including the latest UEFI is a specialty. Software environments that typically use Microsoft Windows are catered for, WinPE conveniently utilized too. Imaging, created and deployed with the advantage of Microsoft tools, reduces costs and ensures support unity. Uniquely, we also combine direct, auto-booting tests, unattended testing and data erasure tools, going direct to hardware to get around operating systems such as Linux. We offer you a superior approach to independently test a variety of computer devices which is difficult for OEM vendor supplied or generic test utilities alone to replicate. Manufacturers and refurbishers alike need process steps to ensure that the PC has been assembled correctly. Visual inspection is necessary, but definitely not always reliable. Human error increases as volume demands increase. Assembly errors are more costly when detected later in the process and even more costly when detected by your customers. PC Builder includes an automatic configuration checking and hardware testing, comparing the in-process unit to a Bill of Materials, ensuring the right parts are installed. Each tested unit record is saved automatically for reference and comparisons. Production tasks often require the correct, up-to-date BIOS to be installed on PCs. With a variety of motherboards comes a variety of BIOS utilities and files to manage. This process can be achieved manually, but involves the operator choosing the correct utility and file. Choosing the wrong utility may only cost you a few minutes – in many cases, choosing the wrong BIOS means an outdated BIOS incorrectly leaves your factory, potentially causing issues with the PC. PC Builder includes functions to automatically engage BIOS flashing routines for your WinPE compatible BIOS flash utilities. PC Builder’s part configuration features ensure that the correct BIOS is used on any motherboard. Higher volume manufactures of Windows machines are motivated to utilize Microsoft’s network based operating system key activation process. This process can be achieved manually with USB thumb drives but adds significant manual steps to accomplish. Lesser volume refurbishers require a more hands-on approach to manage Microsoft COA operating system keys. PC Builder includes built-in functions for safely managing your operating system electronic license keys through automated process steps in the PC Builder process. Manufactures and refurbishers absolutely need reliable computer diagnostic tools. 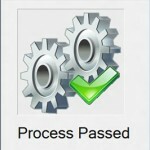 Not only do the tools need to be reliable they also need to be highly usable in your process. Diagnostics also need to fit into the process in an automated fashion to ensure process repeatability and scalability. Also, diagnostic tools must be capable of outputting the test results in a way that makes them easy to collect and consolidate for cross comparisons across various parts types. 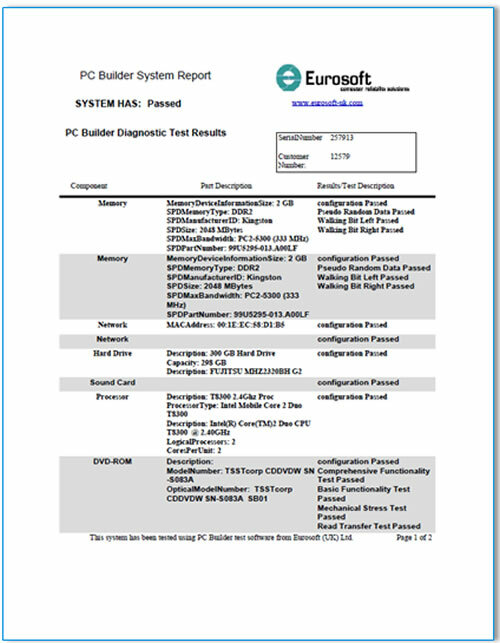 PC Builder allows you to configure diagnostics to the component and to the test phase allowing you total control over automatic diagnostic execution and test result data collection. 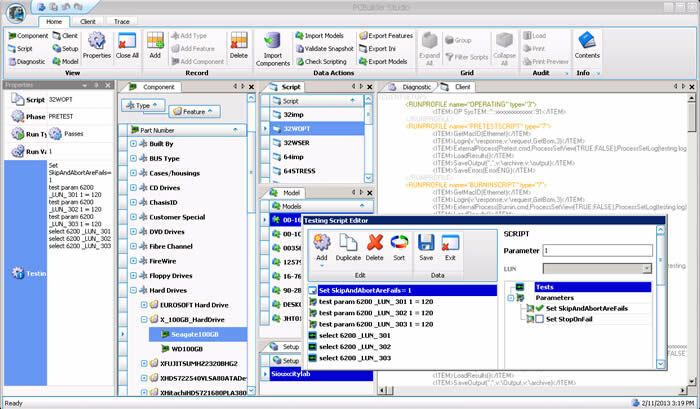 PC Builder also provides multi-phase test configurability allowing you to make a single test script work differently for different test phases. One of the key process steps required by manufactures and often refurbishers is the installation of the operating system and applications. Application installation can involve manually running various setup scripts. Imaging PCs with an operating system is more involved than merely blasting an image onto the drive; some setup steps are required in order to get the operating system installed correctly. If incorrect choices are made, they may not be easily noticed as they would if an incorrect flash utility is attempted. Costly operating keys are lost, potential marketing funds too. Human errors are minimized with automation of imaging processing. PC Builder provides functionality to integrate command scripts for imaging and application installations. As with diagnostic execution in PC Builder, imaging and loading applications are automatic and hands-on as required. PC Builder provides a manual inspection function that allows manufactures and refurbishers to capture manual process steps into the full system record of the PC, allowing manufactures to include this data in analysis and process reports. Two other key process steps for PC manufactures and refurbishers is the final inspection and the audit. The final inspection step is usually performed at the end of the production line just before the unit is boxed for shipment. During this step, the order is verified to have all the required peripherals, keyboard, manuals, cords, etc. and an inspection of the case for scratches and required stickers is conducted. An audit is a full system check including a boot up to check for proper operating system and applications, a physical inspection of the configuration, and a final inspection of the order for peripherals, cables, scratches, and stickers. These steps are often outside the scope of the diagnostic test result records. All of these process steps described above require management by skilled employees and process engineers. The scope of the management required includes test script management, parts identification management, BIOS utility and file management, image and software management and installing, data management, process step management (batches/scripts), and inspection process management to summarize the main areas. 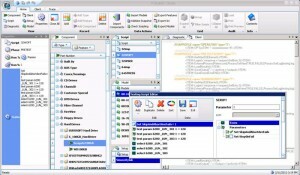 PC Builder provides one powerful application for managing all of the key areas described above. 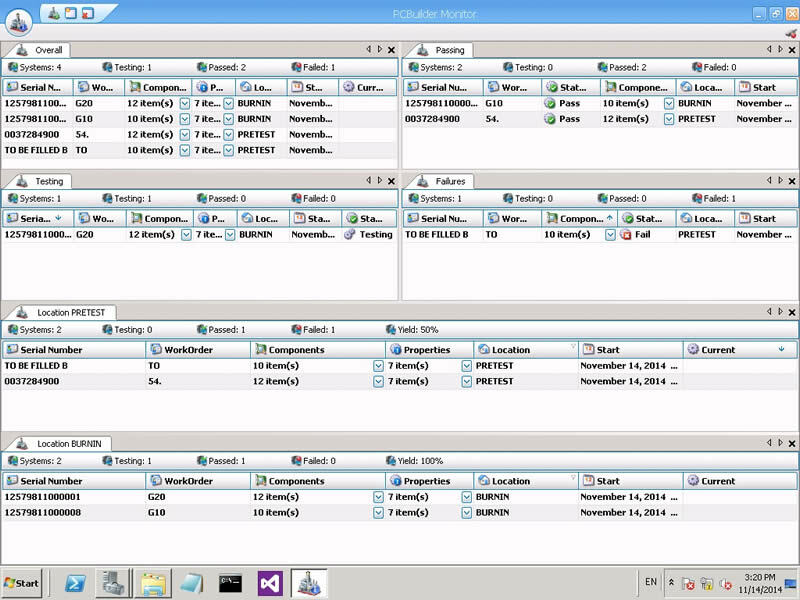 In addition, all of your parts, test scripts, process scripts, special command scripts, BIOS routines, imaging scripts, manual inspections, and more are managed through PC Builder Studio and automatically backed up to a SQL database. 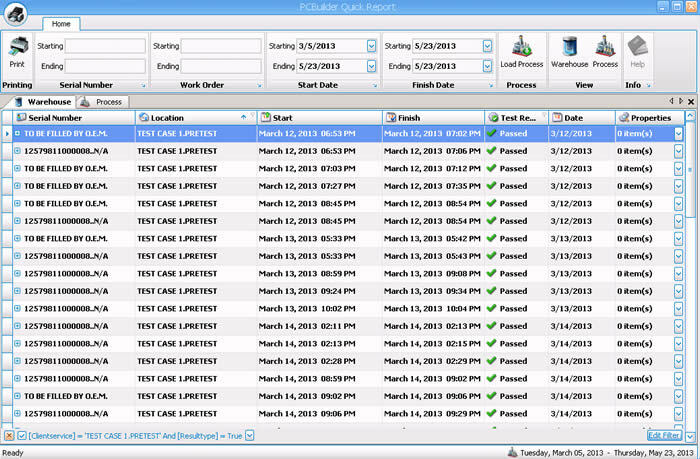 PC Builder accounts for every test process, ensuring validation and 100% traceability. One of the most vital (and possibly least considered) areas of consideration for PC manufactures and evolving refurbishers is the collection and analysis of production process performance data. Simply collecting all the outputs from your diagnostic process is just a small part of the requirement. Test outputs must be collected, associated to the unit, and archived. But the important part of collecting your process data is the ability to analyze the data, derive facts about your operation, and most importantly take corrective action based on solid intelligence. 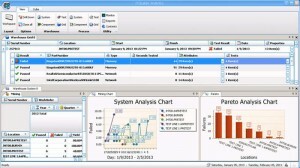 PC Builder includes the power data mining application; PC Builder Analytics. PC Builder Analytics allows you to generate reports for top failing components, tests, and locations as well as pass/fail yield results by factory, location, test, component, and more. 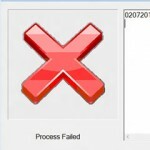 Even installations of operating systems, applications, BIOS flashes and drive erasure tasks are recorded. 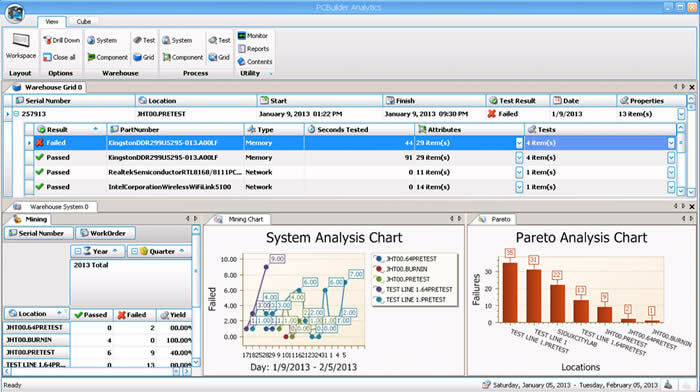 PC Builder Analytics allows users to see failure trends, detect issues with different build lines and locations, drill down to specific failures, and gain visibility on overall process effectiveness informing directors and managers to make critical decisions. Already Have Something Like PC Builder? Add Automation-Friendly Pc-Check Windows to your existing automated process for maximum diagnostic coverage and performance. Pc-Check Windows features relevant return codes for actions such as test and program completion making it the perfect tool for command line jockeys and process engineers. Test a full range of hardware while reaping the benefits of consistent test result outputs. 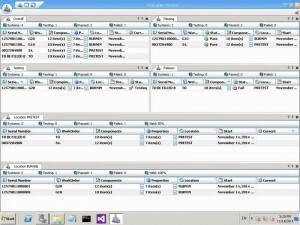 Pc-Check Windows XML based test outputs are also ideal for input into your existing database. 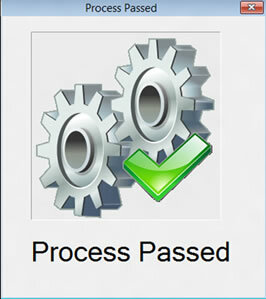 A Pc-Check Windows site license is the ultimate hardware diagnostic finishing touch to your existing automated processes.